Despite the fact that I live in Japan and the school year starts April, for me, I always feel that the school year is September, that is what I grew up with. August is time to kick back and relax and then September kicks in with a new lease of life. August is a good time to catch up on projects that haven't gotten finished too, many of my Clear The Clutter clients have been doing just that. 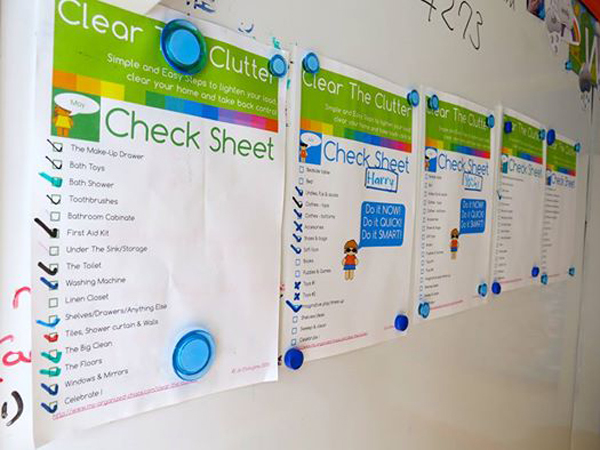 I love the system that one of them set up, she posted all the printouts from the months that she hadn't quite completed then set to checking each item off as she tackled it. Each month, you get a printable and then an email every second day reminding you what your mission is, each mission should take no more than 15-30 minutes (depending on the state of your home of course). And it is designed to tackle one room at a time and give it a deep cleanse, getting rid of junk, clearing out clutter and making space. I am loving watching how everyone's homes are becoming more organized and about hearing how it is helping the whole family too. Plus the team spirit in the Facebook group is great. One thing I really appreciate about decluttering is that you now _know_ what needs to be purchased because you know what's missing and don't have the illusion that you can make those torn pants work in an emergency. I feel more confidence in shopping (which I don't particularly care for). Going back to April's master bedroom, just wondering if people who revamped and decluttered are still keeping up. I've found that now the room us basically neat and well-organized, it is so much easier to do a little tidy up at the weekend and get it square again. DH goes on frequent trips so there are suitcases and basket of laundry sometimes, but overall it is good. For the first time since starting this course, I am up to date with the missions. The rest of the house is benefiting also as it is always in the front of my mind so there is no new clutter being made. So, are you interested in getting your house de-cluttered once and for all, to keep on top of everything and reduce stress, then come on over, we would love to have you! Sign up HERE, I will see you over there.